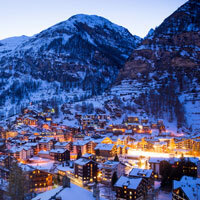 Along with nearby Tignes, Val d'Isère is one of the most dependable French resorts for late-season snow. In fact, Val d'Isère's north-facing slopes mean the resort is often still ski-able in early May. The two resorts share around 300km of high-altitude pistes, so there'll be plenty to choose from whatever your ability. Think European skiing is all about the Alps? Think again. Located near the Norwegian border, Åre is one of Scandinavia's best ski resorts and welcomes skiers well into April, attracted by long hours of sunlight and off-piste activities like reindeer sled-rides, curling and skating. Popular with families, many of Åre's pistes and suitable for beginners and intermediate skiers. The highest ski-lifts in Europe can be found in picturesque Zermatt, tucked in the shadow of the imposing Matterhorn. There are few places in the Alps you're more likely to find late-season snow, especially as local authorities have even invested in a new snowmaking system that can create snow at above-zero temperatures and pump it onto the pistes if needed. Perched high in the Austrian Alps, Obergurgi is a beautiful mountain village that just so happens to have some of the best late-season snow around. Often overlooked by skiers looking for that perfect slice of alpine life, Obergurgi is a quieter option for those who prefer their ski resorts more traditional in flavour. It's also a great choice for families and those who aren't quite Olympic standard, as the slopes are relatively gentle. On the slopes of Mount Cervino, the Italian name for the Matterhorn, Cervinia is one of the best places to grab some late-season Italian snow. The resort's high altitude and well-maintained runs - which includes snowmaking on some key runs - means the ski season here runs until early May. Ideal for beginners, those looking for more adventure can always hop across the border and try their hand at Zermatt's more challenging runs. If you're thinking about going skiing, it's essential you get the right cover for you. At World First, we offer dedicated skiing travel insurance that'll give you all the peace of mind you need for the pistes - including cover for equipment hire and slope closures.